Authorities in northwest Indiana on Sunday safely disarmed a samurai sword-wielding man after they found him walking along Interstate 65 near Merrillville. The still-unidentified man was discovered wandering along the interstate just south of U.S. Highway 30 about 2:30 p.m. "marching like a drum major" while holding the 35-inch sword, state police said in a news release. The shirtless man, who appeared to be in his mid to late 40s, moved the sword rhythmically like a baton until Master Trooper Rick Hudson approached, officials said. The man swung defensively at Hudson but dropped the sword when Hudson ordered him to, authorities said. A passing car -- a 2010 Chevrolet SUV -- swerved off the road onto the shoulder near the area to avoid a police car stopped at ths scene, police said, and the suspect then tried to get into that vehicle before being ordered to the ground at gunpoint. Merrillville police then took him into custody. Once in custody, the man gave authorities different names and addresses, but told Lake County Jail officials that he was "Cuckoo for Cocoa Puffs." Authorities were first called to the scene after a white older model Toyota was abandoned in the middle southbound lane of I-65 just south of 61st Avenue. Though his identity hadn't been verified, authorities charged the man with attempted carjacking, resisting law enforcement and possession of marijuana. A "very volatile and very fluid" situation was defused without incident Saturday morning when a man wielding a sword in a darkened basement put the weapon down when ordered to do so by Madison, WI. police. Melvin Moore, 39, was tentatively charged with burglary, disorderly conduct and a probation violation, following his arrest at about 8 a.m. Saturday in the basement of an apartment building in the 1100 block of East Gorham Street, Madison police said. The building owner found a stranger sleeping near a storage area in the basement and called police. "As the officer approached the man, she could see through the darkness that he had armed himself with a sword," said police spokesman Joel DeSpain. "He also had a large dagger in a leather sheath slung across his back." DeSpain said the officer had to decide quickly whether to shoot or not, while a second officer trained a TASER weapon on the suspect. "He slowly and reluctantly placed the sword and leather sheath on the floor," DeSpain said. The suspect allegedly took the weapons from a storage area in the basement. DOUGLASVILLE, Ga. -- Police said a 15-year-old boy attacked his grandmother and great-grandmother with a 35-inch Samurai sword when they told him to stop playing video games. The great-grandmother died of her injuries. Gevin Allen Prince has been charged as an adult in the August stabbing death of 77-year-old Mary Joan Gibbs. Authorities said the teen’s grandmother, 55-year-old Laura Prince, is recovering from her wounds. Prince is charged with murder and aggravated assault. He is being held in the Douglas County Jail without bond. Public defender Travis Glahn said a preliminary hearing on Thursday could lead to his client being given a psychological evaluation. Authorities are challenging one Washington father to a serious legal duel. Thurston County sheriff's deputies claim that Renaissance fair enthusiast Fremon Seay disciplined his step-daughter by forcing her to suit up in chain mail armor and fight him with a wooden sword. Authorities say that Seay did battle with the 16-year-old girl for two hours until she eventually collapsed from exhaustion, according to The Olympian. Police also claim that Seay struck his daughter with a tree branch before the sparring match began. Seay, 38, told authorities that his daughter was at a crack house that Saturday, and that because she is 16, he and his wife, Julie, can discipline her as they see fit. Other reports said the girl was at a party. Puyallup police arrested the girl late Saturday night, The Seattle Times reports, but it's unclear why they busted her. Investigators say Fremon and Julie, who allegedly watched the battle without intervening, are both members of a Renaissance group that recreates medieval battles. Fremon Seay is charged with second-degree assault involving domestic violence and a weapon. Both parents were released from jail on Monday after posting bail. A man has allegedly stabbed his son with a samurai sword during an argument. Emergency services were called late last night to a home in Inverell in northern NSW, where police found a 27-year-old man with a large stab wound to his stomach and a fractured rib. They were told the man and his 45-year-old father had been drinking at the home in Cunningham Place when they began arguing around 9.30pm. It is alleged the father then stabbed his son with the sword. Paramedics took him to Inverell Hospital where he was reported to be in a stable condition on Sunday, but was not talking to police. The father was arrested and charged with two counts of reckless wounding. He was refused bail to appear at Moree Local Court today. before we start casting stones here... I would like to know what the argument was about. A dad in Jaipur, India, was unhappy with his daughter's behavior, so he reportedly sliced off her head Monday with a sword and paraded it around his village, say police. You know, as a self-appointed arbiter of good behavior and all. Mitur Bin Izdurti's 20-year-old daughter had been living at the family home for the last two years after leaving her husband. Two weeks ago, the adult woman (did we mention she was 20?) had the audacity to elope with a new man, enraging her monstrous-sounding father. He lured her back home, unsheathed his sword and executed her. After spending the day showing off what he'd done, he surrendered (finally) to police. That might be my best website. HOUSTON: A US police officer has shot and killed a one-armed, one-legged man in a wheelchair after the double amputee waved a metal object that turned out to be a pen. Police spokeswoman Jodi Silva said the man cornered the officer at a group home on Saturday and was making threats while trying to stab the officer with the pen. At the time, the officer did not know what man was waving, Silva said. Advertisement "Fearing for his partner's safety and his own safety, he discharged his weapon," Silva said. Police did not immediately release the name of the man who was killed. They had been called to the home in Houston, Tejas, after a caretaker there reported that a man in a wheelchair was causing a disturbance. The owner of the group home, John Garcia, told the Houston Chronicle that the man had a history of mental illness and had been living at the house about 18 months. Garcia said the man had told him he lost a leg above the knee and one arm when he was hit by a train. Silva identified the officer as Matthew Jacob Marin, a five-year veteran of the department. Houston police records indicate that Marin also fatally shot a suspect in 2009. Investigators at the time said Marin came upon a man stabbing his neighbour to death at an apartment complex and opened fire when the suspect refused to drop the knife. You're a bad person, dude. where's that filthy brown little finger been 'von? 3/4 of a cup is too much ! World Sword Swallowers Day is almost upon us!!! I would like to see just how much you can swallow. Two police officers have been injured after a man ran at them with a samurai sword. Four police officers went to a home at Eungai Creek, in mid-north New South Wales, to arrest the man, who had an outstanding warrant. Police allege the 51-year-old man ran at the officers with the sword and attempted to unsheathe it. Police spokeswoman Joanne Elliot says two officers and the suspect were injured in the struggle. "We've also had a constable who had to be treated for a cut to his left hand, and a detective also injured his right hand and left arm." "The 51-year-old man was released from hospital. "He has been charged with that warrant along with using a weapon to avoid apprehension and resisting arrest." A Samurai sword-wielding Mormon bishop came to the rescue of a woman after he saw her being attacked in front of his house. Kent Hendrix, from Salt Lake City, grabbed the 29-inch blade after his son had alerted him to a potential mugging outside their home in East Millcreek, a suburb in Utah. Mr Hendrix, a martial arts teacher, then came face to face with the suspect. "He was kind of taken aback to have a sword drawn on him and he jumped back," said the 47-year-old, who keeps the carbon steel blade next to his bed. "He said, 'I'm leaving,' and turned and ran, so I ran after him. I didn't want him to get away anonymously." The suspect, 37-year-old Grant Eggertsen, had approached the woman and attempted to steal her door keys as she exited her home in early hours of Tuesday morning. Attempting to force his way into her house, the women then ran away from the attacker, screaming and alerting several neighbours to her predicament. Later turning himself in to the authorities, the suspect was jailed on suspicion of robbery, burglary, trespassing and stalking, police spokesman Lieutenant Justin Hoyal confirmed. Mr Hendrix, a bishop at The Church of Jesus Christ of Latter-day Saints, said it was the first time in 30 years of practicing martial arts that he had used the sword and that it was only used to shock the suspect. A fourth-degree black belt in the Kishindo form of martial arts, Mr Hendrix owns a collection of swords and weapons that he uses to train with. "Some people have bats they go to, I have my sword," he told Huffington Post. It later emerged that Mr Eggertsen and the woman, who has not been identified, had previously worked at the same company, however after their relationship turned sour, the woman had obtained a protective order against him. Mr Hendrix described the rescue as an "interfaith effort" to apprehend the suspect, as Catholic and Protestant neighbours were also involved in the incident. Well done Mr Hendrix, have another wife on me. Don't bring a knife to a gun fight, dumbass. There's pretty great video of the dude getting tased...saw it on the news, can't find it online yet. SANTA ANA, Calif. (KABC) -- A 29-year-old man wielding two large Samurai swords was Tasered and arrested Friday in Santa Ana. Police started receiving several 911 calls about a male carrying swords and yelling profanities around 10:30 p.m. Responding officers found Hung Anh Nguyen near a restaurant on the 700 block of Harbor Boulevard near McFadden Avenue. Nguyen allegedly refused to drop the two swords, one measuring 27 inches long and the other 19 inches. That's when police Tasered him and took him into custody. He was booked at the Santa Ana Police Department for no bail narcotics warrant, assault with a deadly weapon and possession of swords. 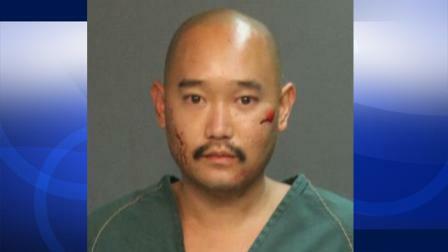 Jail officials will determine whether Nguyen needs a mental evaluation following booking.